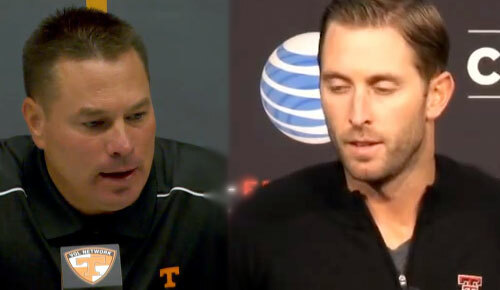 Butch Jones, Gus Malzahn and Kliff Kingsbury were some of the bigger hires during this past off season in college football. All have had their ups and downs this season and all have the possibility of a bowl game within reach. While Kingsbury and Texas Tech have had more success on the field Jones and his Tennessee Volunteers have no doubt had a tougher road. To this point the Vols have played six teams in the top 15 and their seventh will be on Saturday as they host Auburn. The current 4-5 mark was within inches of being 5-4 but there is no doubt that Coach Jones has a long road to hoe or as he refers to it as ‘the process’. Speaking of Auburn, they are currently ranked in the top 10 a year after not winning a conference game. With new head coach and former offensive coordinator Gus Malzahn at the helm, the Tigers have shown a lot of fight and even pulled off a few upsets. The are now a legitimate threat to no.1 Alabama in the Iron Bowl in a few week. Kingsbury has revitalized a fan base still bruised from the firing of Mike Leach a few years ago and left disillusioned by the Tommy Tuberville regime. Kingsbury has done it with true freshmen QB’s (one a walk on) and a little bit of West Texas magic. While they will not win the Big 12 this season they are going to a bowl game and the expectations have been elevated for next season. While all the coaches are different and all of the circumstances unique, all three are on a path to turning around a football program. While some have made that turn faster than others the expectations of the fans will always be for an overnight success. Right or wrong, a quick turnaround can be a coaches own worse enemy.